Wise words, those. If I were to be a little more literal, the month of July is one big birthday cake for my family. Starting with my mom, then my brother, Dexter puppy, yours truly and finally ending with my dad – almost all the family birthdays in one crazy month. Each year, I bake a lot of cakes in July and, each year, I try my best to try new cakes and not repeat myself. There are trial cakes, “bringing in” cakes, party cakes, even cakes for my brother who doesn’t even live here anymore. I really take the term “birthday month” quite seriously! But with everything going on, I almost never manage to document all this crazy baking. This year, I began with a lemon and orange syrup cake, an apple and coffee crunch, a rum ‘n’ raisin cake and finally ended with my favourite brownies, this time with an espresso twist. I promise to add all these cakes to my recipe list and link them up here before too long! Somewhere in between all these cakes, I found myself with 2 cans of Dulce de Leche. 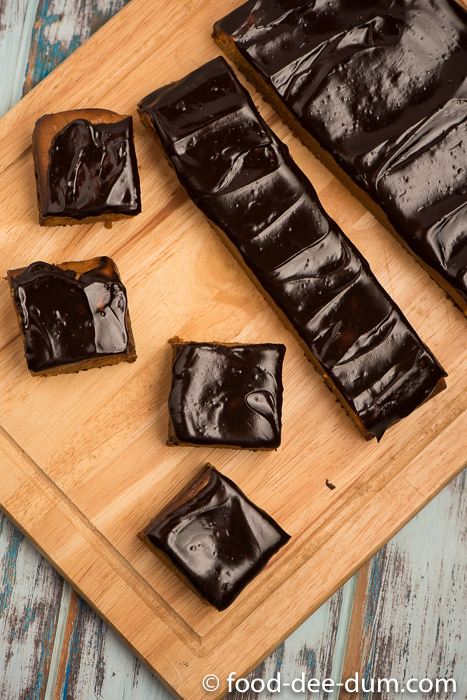 I wanted to do something fun so I decided to bake them up as bars and top with chocolate ganache. 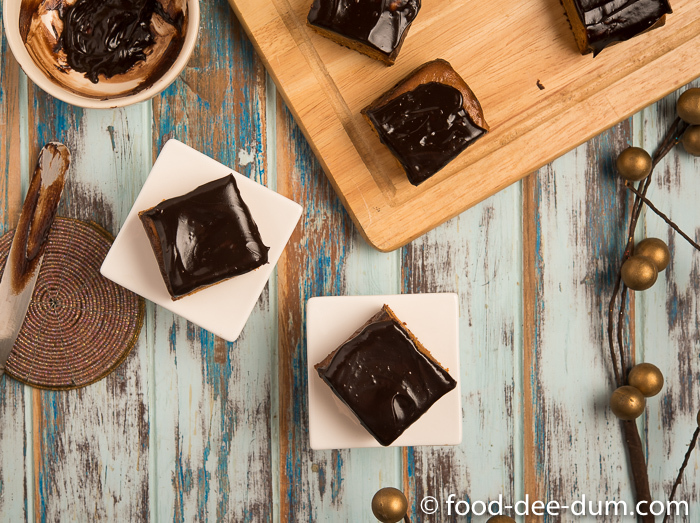 A simple recipe, with easy ingredients, they were actually an adaptation of my favourite fudgy brownies – except it uses DDL instead of chocolate! 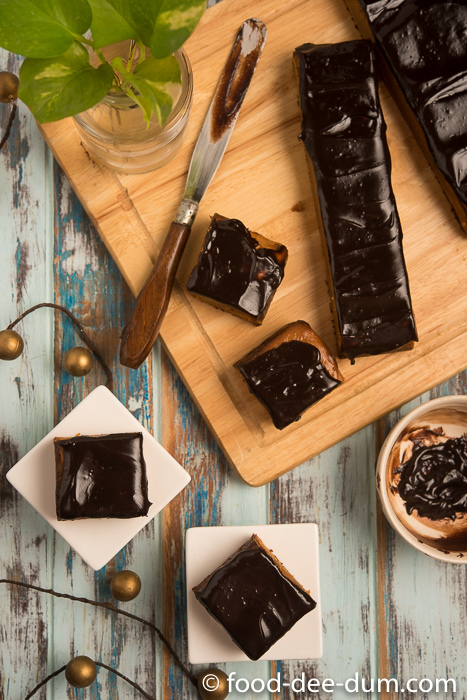 Turned out better than I expected – a little cakey, very fudgy, with a deep caramelised base and a rich dark chocolate topping. You can serve these bars up with tea/coffee or even as dessert. Make them ahead and chill overnight or serve them fresh and warm – they are pretty versatile. And not half bad dipped in milk like a cookie either! Have I mentioned that ganache is one of my favourite toppings ever? Buttercream and fondant are generally too sweet for my taste, cream cheese frosting works well most of the time and I love this cheat’s buttercream from Pioneer Woman. But nothing warms my heart like a silky, glossy dark chocolate ganache. It helps that it’s so low effort and intensity and is ready in a jiffy. 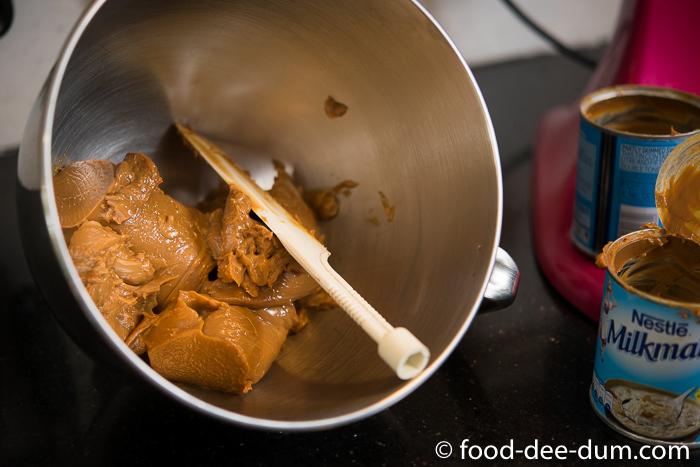 First, I set the oven to pre-heat at 180 C. While the oven was heating, I emptied out the Dulce de Leche into a bowl and whipped it on medium speed until smooth. I then added in the eggs and whipped it for another 2 minutes on medium speed. The consistency was fairly runny. Then I added the flour and mixed on low just until the flour was incorporated. I added the Jim Beam and gave it another quick whirl. I lined an 8×8 tin with parchment and smeared it with a thin coat of softened butter and poured the mix int the tin, levelling the top. I gently banged the tin on the counter to release the air bubbles. I popped it in the oven to bake for about 25 minutes. Lowering the heat to 150 C, I gave it another 8-9 minutes until a skewer inserted in the centre came out clean. I allowed this to cool in the pan for about 15 minutes and then lifted it out using the overhanging parchment paper and placed it on a cooling rack to cool completely. 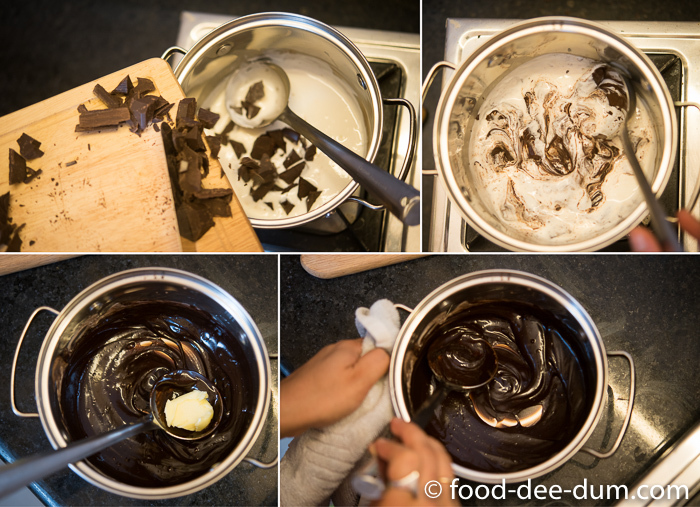 This is important because if you spread the ganache while the base is still hot, the ganache will become too runny. For the ganache, I chopped up some chocolate into small pieces so they would melt quickly and evenly. I poured the cream into a heavy bottomed saucepan and placed it on medium heat for a few minutes, just until tiny bubbles started appearing on the sides. 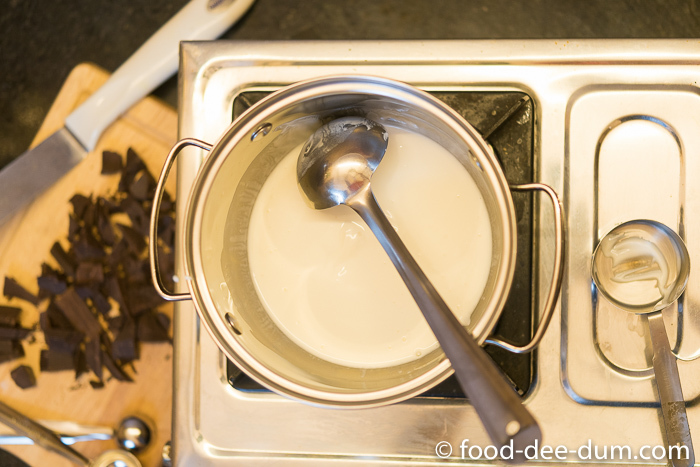 Watch this closely as you don’t want the cream to boil, just be warm enough for the chocolate to melt. Turning the heat off, I added in the chocolate and mixed it briskly until all the chocolate melted and it became a smooth, thick sauce. Then I added in the butter and stirred just until smooth and glossy. Allowing this to come to room temperature, I poured it onto the baked caramel base and spread it evenly using an angled spatula. I popped the whole thing in the fridge for half hour before cutting them up into bars. 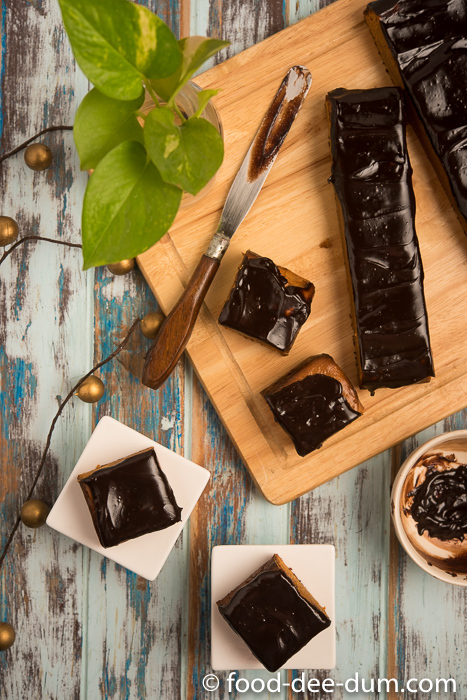 The caramel base was dense and fudgy while the ganache topping was just the right “icing on the cake” – smooth, glossy, rich and delicious! I love these bars so very much because they’re so easy to make and yet feel like a rich, sinful dessert. They keep very well in the fridge for up to a week. They taste as good chilled and there’s literally no reason to warm them up before eating them. Needless to say, they didn’t last a week in the studio fridge. The whole lot was wiped clean in just one evening! PS: on retrospect, I thought that a teeny sprinkle of coarse sea salt may have elevated these bars to a whole new level. If you try that out, do tell me what you thought. 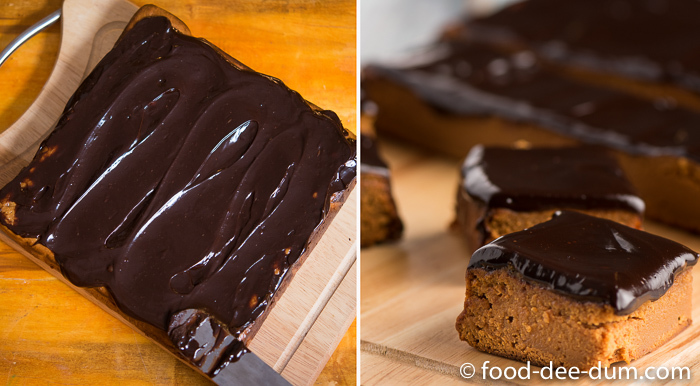 Easy recipe for baked caramel bars, using very few ingredients, and yet makes for a delicious, rich and impressive looking dessert. 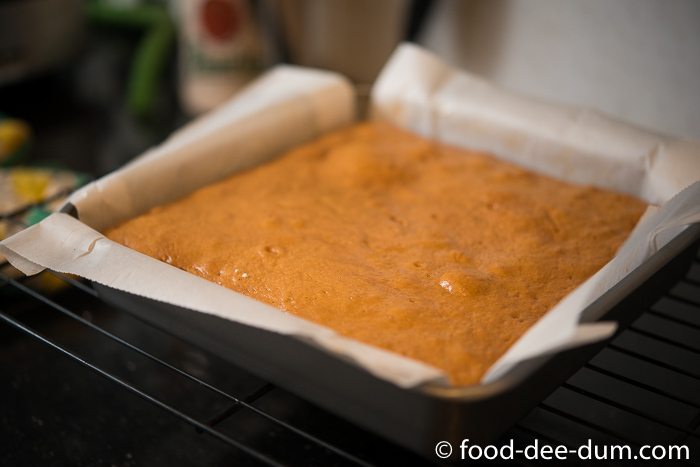 Pre-heat the oven to 180 C. Prepare an 8x8 inch square cake pan by lining it with parchment paper and brushing a thin coat of softened butter on it. Keep aside. 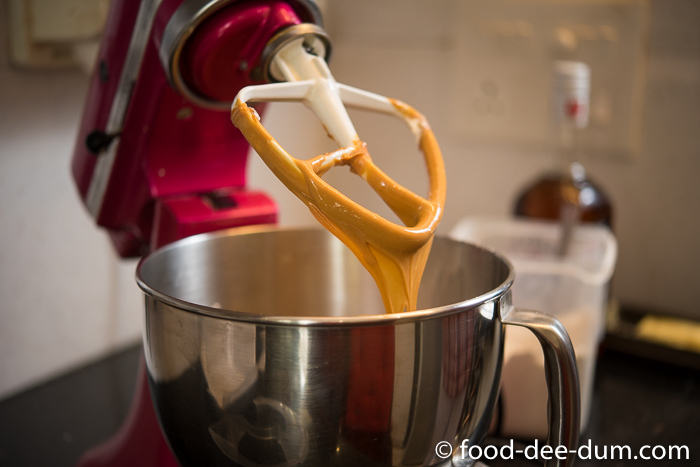 Empty out the Dulce de Leche cans into the bowl of your mixer. Beat on medium speed for about 2-3 minutes until smooth. Add the eggs and beat for another minute until well incorporated and smooth. Add the flour and mix on low speed, until there are no floury streaks. 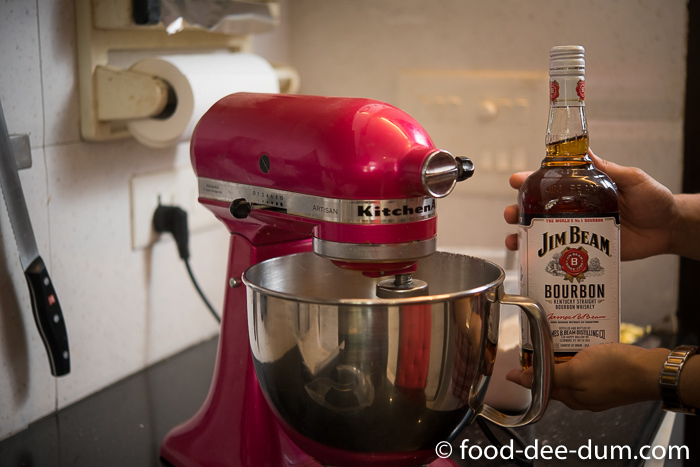 Add the Jim Beam/ Vanilla Essence and stir. Spoon into the prepared pan and bake for about 25-30 minutes or until a skewer inserted in the middle comes out clean. Let it cool in the pan for 10-15 minutes. 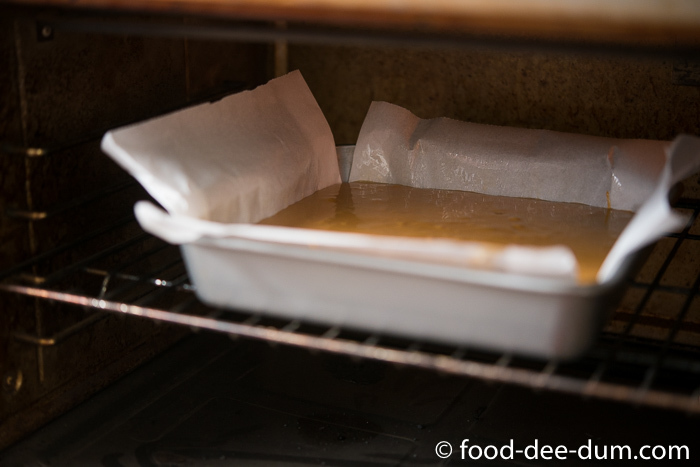 Lift out using the overhanging parchment and let it cool completely on a cooling rack. 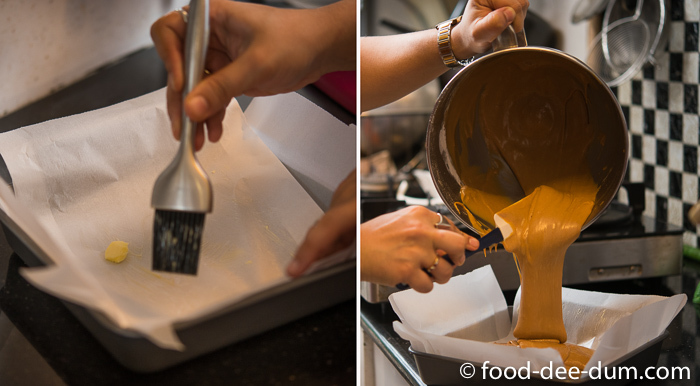 Once cool, make the ganache. 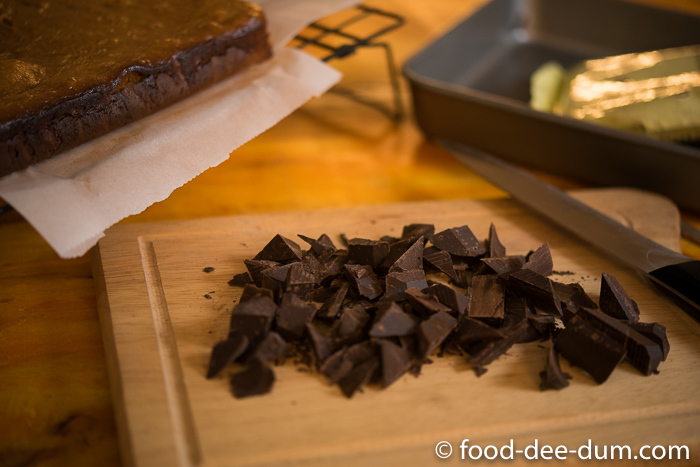 First, chop the chocolate into small pieces, as small as you can manage. Keep aside. 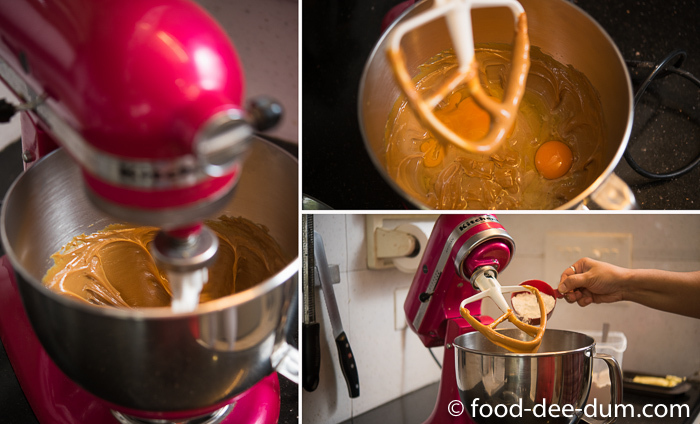 Pour the cream into a heavy bottomed saucepan and place on medium heat, just until tiny bubbles appear on the sides. About 1-2 minutes. 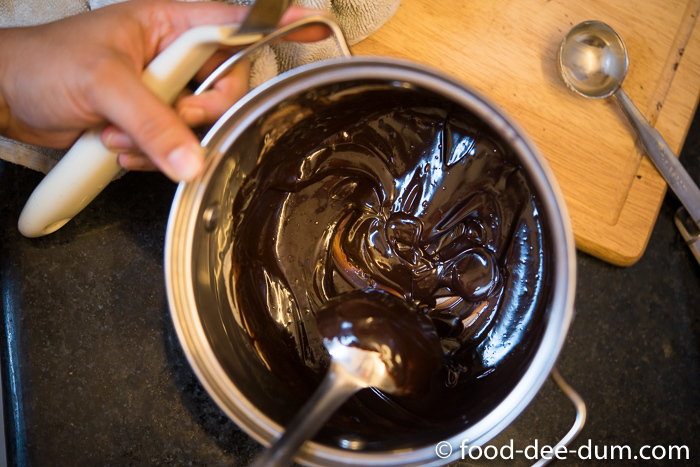 Turn off the heat and add in the chopped chocolate, stirring briskly until all the chocolate melts and forms a smooth sauce. Add the butter and stir until glossy. Cool. 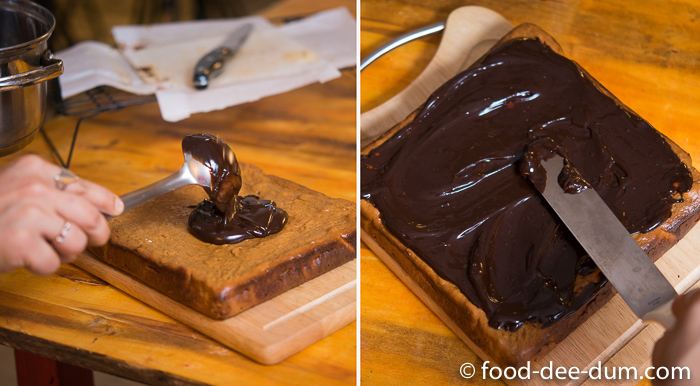 Once the base and ganache are both cool, spoon the ganache onto the base and spread in an even layer. Chill for 30-40 minutes before cutting it up into equal sized bars.